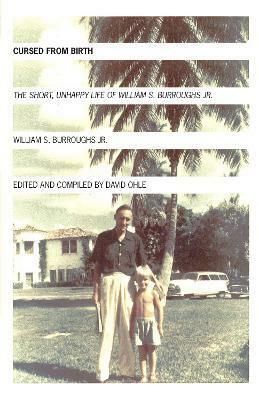 Cursed from Birth : The Short, Unhappy Life of William S. Burroughs, Jr. Being the son of counter-culture author William S. Burroughs is bound to be a trial. After all, the man who frequented lesbian dives and had a fascination with firearms couldn't possibly make that great of a father. Perhaps inevitably, William Jr. (called Billy) referred to himself as "cursed from birth" and in the book of the same name editor David Ohle collects parts of Billy's third and unfinished novel Prakriti Junction, his last journals and poems, and correspondence and conversations to recreate this tortured life. Endowed with the sufferings -- but not the patience -- of Job, Billy's life was often characterized by tragedy and frustration, although there were also pockets of success and levity. More than just the memoir of a casualty of the Beat Generation, Cursed From Birth provides rare insight in Billy's father, as well as his scene, friends, and times. It also provides an all-too-familiar story of familial difficulties that anyone with difficult parents can understand and appreciate.